In this blog, our travel experts cover the best diving sites accessible in Mexico's western coast! With hundreds of miles of tropical coastline on the Pacific Ocean, the Sea of Cortez, and the Gulf of Mexico, the country of Mexico has a myriad of world-class scuba diving sites to explore. In this guide, our travel experts here at The Adventure Group cover the best of the best, giving special attention to Mexico’s western coast. Read on to learn more about the best sites to go scuba diving in Mexico and book your next dive with our award-winning team here at the Adventure Group today! Located at the very southern tip of Baja California where the waters of the Pacific Ocean and the Sea of Cortez meet, Land’s End is of the most unique dive sites in all of Mexico. The area is famous for its breathtaking rock formations, including the picturesque “El Arco” (“The Arch”), an enormous rock arch that divers can swim through. On our Diving Tour at Land’s End and the Arch, you’ll get the chance to experience “El Arco,” Neptune’s Finger, a world-famous sea lion colony, and a host of other amazing geology and marine life up close and personal. North of Cabo San Lucas, Cabo Pulmo National Park offers scenic diving made for marine wildlife lovers. Rescued from overfishing and pollution during the latter half of the 20th century, Cabo Pulmo National Park is a living monument to the powers of preservation in action. The park’s coral reef (the oldest and northernmost coral reef in North America), once nearly destroyed, is now teaming with a diverse array of oceanic life spanning from small fish to large marine mammals. The reef itself has a number of “fingers” of hard coral atop rock outcroppings that run parallel to the coast, each occurring in progressively deeper water offshore. These make truly amazing backdrops for dives ranging in difficulty from beginner to advanced. 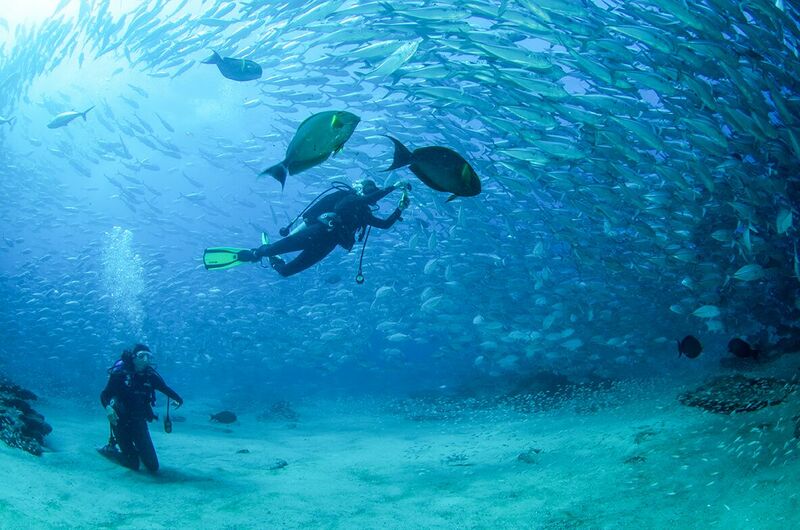 Named a UNESCO World Heritage Site in 2005, Cabo Pulmo National Park is an underwater treasure that can’t be missed. Dive into the waters of Cabo Pulmo National Park on our Cabo Pulmo Diving Tour here at The Adventure Group, and experience all that this amazing site has to offer. Moving even farther north along Baja California to the Bay of Banderas, home of the famous coastal city Puerto Vallarta, divers will be pleased to discover a remote collection of islands located just where the bay meets the Pacific Ocean. These are the Marieta Islands, home to some of the best diving Mexico has to offer. Just under the surface, the islands show their true colors. Spectacular marine flora and fauna thrive along the slopes of a breathtaking underwater mountain range. Escape the crowds for a dive unlike any other on our Marieta Islands Scuba Dive experience here at The Adventure Group! The west coast of Mexico is actually home to two separate coastlines. The westernmost is located along the Pacific Ocean; the other is located on the Sea of Cortez. Nestled between the Baja California peninsula and the mainland of Mexico, the Sea of Cortez (also called “the Gulf of California”) is known for its calm waters and an incredible array of marine life. Like Cabo Pulmo National Park, the Sea of Cortez was named a UNESCO World Heritage Site and is protected from overfishing. (Though commercial operations do still exist in the region.) Those looking for calm dives teaming with a myriad of marine life will find no shortage of amazing mammals, fish, and other animals in the Sea of Cortez. Check out our Sea of Cortez Adventure here at The Adventure Group for the perfect diving introduction to this truly spectacular body of water. Ready to go scuba diving? Mexico has many options to offer. For the best dives at the best locations, there is no better place to book than right here at The Adventure Group. With centers in Puerto Vallarta, Cabo San Lucas, and Cancun, our award-winning team proudly leads dives at some of the top sites across Mexico. Whether you are a beginner or seasoned diver, you’ll find that we have a myriad of expeditions tailored to meet your needs. Explore our site to learn more about our many dives, and book with our team today!